Since August 2016, Cope, by artist Damien Vera, has delighted visitors of Rye Town Park. Until recently, the sculpture had been on loan from the Art Students League of New York as part of The Rye Arts Center’s Public Art Initiative. 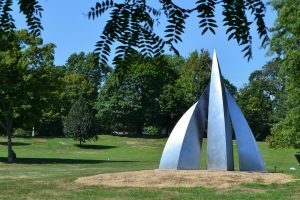 With the approval of The Rye Town Park Commission, The Rye Arts Center has purchased the sculpture so that it can remain in the park permanently. The sculpture was first installed in Manhattan’s Riverside Park along the Hudson in 2012. It is 14’ tall and is comprised of five curved steel towers. The outward-facing sides of each are made of stainless steel. The inward-facing sides consist of a more harsh and industrial steel. Hidden within each structure is a sculpture of a human figure, visible through a small slit. The figures will only be seen by the most inquisitive of viewers. “I want it to be for curiosity,” explains Vera who wanted to create an environment with which the viewer could interact. Cast against the beach-side park, some see the structures as sails or fins, while others see a shining claw breaking through the earth. The artist encourages viewers to use their imagination and find their own interpretation. This entry was posted in Press Releases and tagged public art, rye, sculpture. Bookmark the permalink.